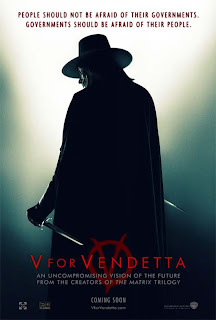 Toward the end of V for Vendetta, just before V goes to carry out the last part his plans, he says to Evey (Natalie Portman), "The time has come for me to meet my maker and to repay Him in kind for all that He's done." This statement is overtly indignant, which is understandable. At the same time, I suspect that V is not as damned as he might think. In many ways, V is a practical example of godliness. His grasp of justice is certainly light years ahead of the men who have taken over the British government. V does the best he can with his life for the good of other people. He overcomes unimaginable hardship and injustice to strike a blow against the corruption that was stifling England as a whole. V uses his physical and mental facilities to defend the defenseless and empower as many people as he can, right up to his deathbed. He inspires the entire nation with a new vision of hope and love for justice. If there was any doubt about the quality of his heart or his dedication to justice, he ends up giving up his own life so others can move forward and benefit from his efforts. C.S. Lewis describes a similar outlook on the "qualifications" for salvation in the last chapter of his final Narnia book -- The Last Battle. Though the Calormenes are generally at odds with Aslan and the Narnians (Aslan's chosen people), there is one Calormene who stands apart from his peers for his quality of heart, in particular his convictions about who God must be and what is truly justice.